Jim Visits the Tim DeMoss Show - Cardiac Care & Safety, Inc. Jim Visits the Tim DeMoss Show - Cardiac Care & Safety, Inc. 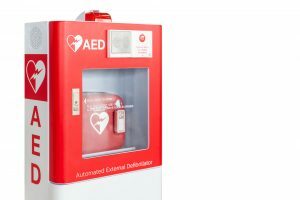 In honor of National Heart Awareness Month, Jim Spaulding, of Cardiac Care & Safety, Inc., sits down with Tim DeMoss, of WFIL AM560, to share information regarding CPR training and stories that reaffirm why CPR training and an on-site Automated External Defibrillator (AED) can make a huge difference during an emergency. Let’s overview some safety successes that the two discuss during this segment. During the interview Jim’s neighbor came on the show to tell his amazing story of surviving a Sudden Cardiac Arrest. At 48 years old, Steve went into sudden cardiac death on a high school basketball court. Luckily, there was an AED within feet, the batteries had just been changed and two teammates were trained to use the device. In February 2001, Louis and Kyle’s stories were published in the Philadelphia Inquirer. The news of these tragedies inspired the creation of the Louis T. Savino, III Foundation, an organization committed to AED awareness and heart-safe schools. The AED that shocked Steve’s heart back to a normal rhythm was the first AED ever donated by the Louis T. Savino, III Foundation. Tim adds, “There are several steps here” that made this outcome a positive one — an on-site AED and a group of fast acting individuals that had training. At Cardiac Care & Safety, Inc. Jim works with a variety of health care industries that require training in Pennsylvania every two years; however, he also offers training to groups who want to be prepared in emergency situations. Instead of pulling out the sticky marshmallow, he pulls out his child’s two front teeth! Luckily, Emily had been trained and was able to perform abdominal thrusts, also known as the Heimlich maneuver, to dislodge the marshmallow. Basic training does pay off! Tim remembers when his 10-year-old son, Toby, saved his choking daughter after attending a Cardiac Care & Safety, Inc. basic first aid training course with his Boy Scout troop. Jim and Tim wrap up this segment with a final story that lead to a man’s full recovery. Like Steve’s courtside experience, an over-exerted man went into cardiac arrest while playing hockey. Luckily, there was an on-site AED and a teammate who was medically trained to provide CPR for several minutes until emergency responders arrived. Read the full story here. Since 1998, Jim has helped thousands of businesses, organizations and individuals in the Tri-State area complete safety training. Whether you are Boy Scout, nervous mom, or an individual that requires mandated training, Cardiac Care & Safety can help you remain prepared.